20th Anniversary Roots Reunion and Open Air Hair Day! June 2/Noon until 7 p.m. In celebration of our 20th anniversary, join us at our Roots Reunion and Hair Day in the Open Air! 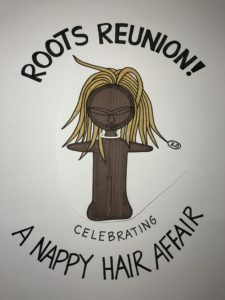 At the Roots Reunion, we will reconnect with regulars and newcomers and recreate the sweet simplicity and positive energy of the original Hair Day gatherings! Nap-nurturing will be the order of the day, but all hair textures and cultures are welcome and won’t be turned away! It will be a day of communal natural hair grooming, music, impromptu entertainment, vending, voter registration and re-connection. We will also be recording hair conversations on the StoryCorps app to become part of the Library of Congress history archives.